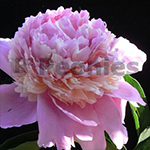 Raspberry Sundae is one of the most beautiful bicolour Peonies. With the slight fragrance is Raspberry Sundae blooming in the middle season. With flowers up to 15 cm and the dark foliage, Raspberry Sundae is used a lot for cut flower crops as well for land­scaping in gardens and city parks. Every year older the plant gives more and more flowers. Mr. Ed is a chimera mutation of Mons. Jules Elie. 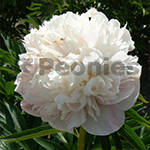 This extreme beautiful, of the purest pink and white coloured double Peony is an absolute winner. With the slight fragrance is the Mr. Ed blooming in the middle season. With flowers up to 15 cm and the dark foliage Mr. Ed is used a lot for landscaping in gardens and city parks. One plant can have both colours and mixed flowers. Beautiful. Every year older the plant gives more and more flowers. 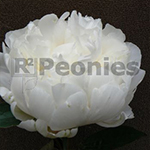 Alba Plena is one of the first blooming double and white Peonies. Not spectacular, but early. This variety requires some staking because the flowers are a little short. Alba Plena is sometimes used for cut flower cultivation but has more use for landscaping. 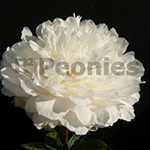 To order Peonies for wholesale, contact one of us for details. White Sarah Bernhardt® is a name which has been given by a marketer. It’s not a mutant of the world famous Sarah Bernhardt but an imported Peony from China. 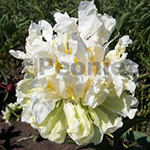 It’s a beautiful double white flower, very suitable for cutting. With flowers up to 15 cm and the dark foliage it’s an eye catcher in your garden. Every year older gives the plant more flowers.